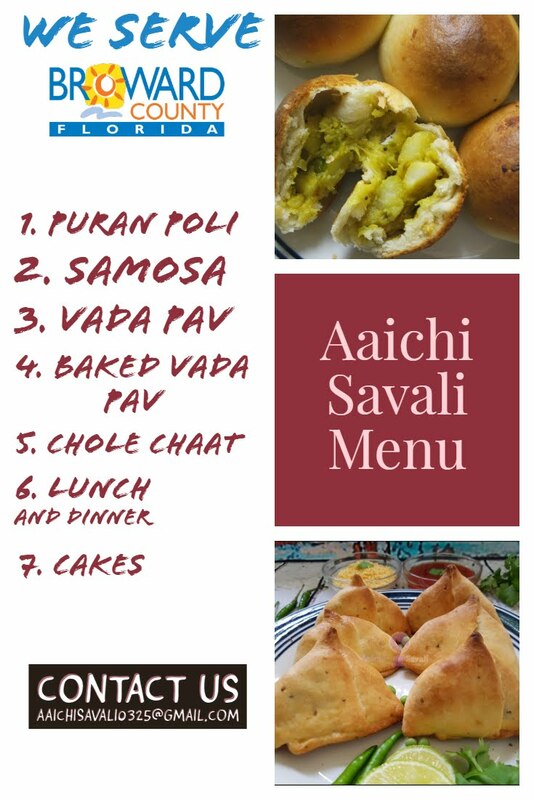 experimenting with food, and this one is my innovative recipe. My husband and I liked the way these patties came out. 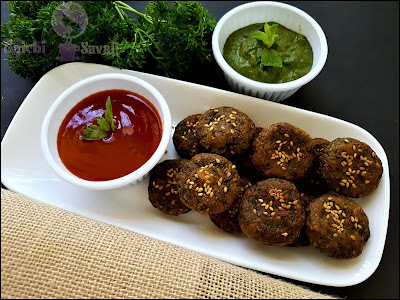 These patties are easy to make, tempting and scrumptious. Isn't it? 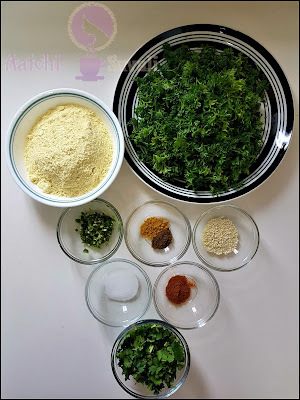 This Parsley bites recipe is Indian cuisine inspired recipe; it is just like coriander wadi. If you are familiar or likes the coriander wadi (I am the biggest fan of this coriander wadi/ Kothimbir Wadi) or you have eaten coriander wadi, then I am damn sure that you will love these patties too! Parsley is widely used as a garnish or topping in various European, American, and Middle Eastern cuisines. It is also used as the main ingredient of a salad such as Lebanon’s Tabbouleh and condiments such as Italy’s salsa verde. Also, it is used in soups, stews, pasta dishes, spreads, marinades, dips or added to salads and smoothies. 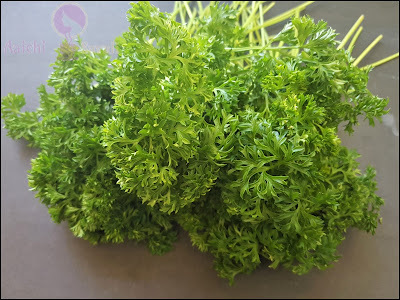 Parsley was traditionally taken as a tea for treating gallstones, indigestion, kidney stones, constipation and bloating. Parsley is also known to be a super food because it’s packed with beneficial nutrients, essential oils, and antioxidants. Many dishes are served with fresh chopped parsley sprinkled on top. Parsley adds a lovely flavor to creamy salad dressings. Each Serving of Parsley Patties / Parsley Bites Contains 71.58 Calories. 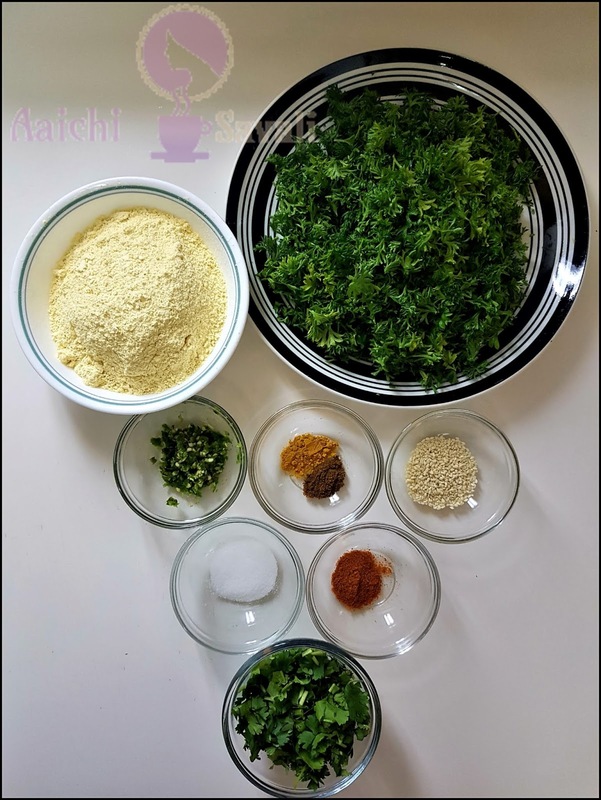 coriander leaves, gram flour/besan, ginger-green chili paste, red chili powder, salt, garam masala, turmeric powder, sesame seeds and lemon juice and mix all well. Knead to make the dough, if needed add water. Divide dough into equal portions. Grease your palm with oil and roll each portion and make patties or tikkies. 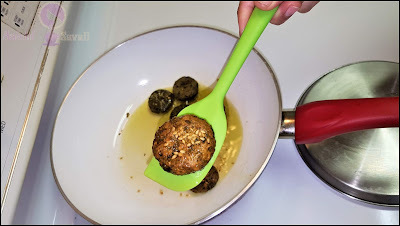 Place rolled patties over oil greased idli stand and sprinkle some sesame seeds over each patty (If you don't have Idli stand in your hand, you can use PIP method too). 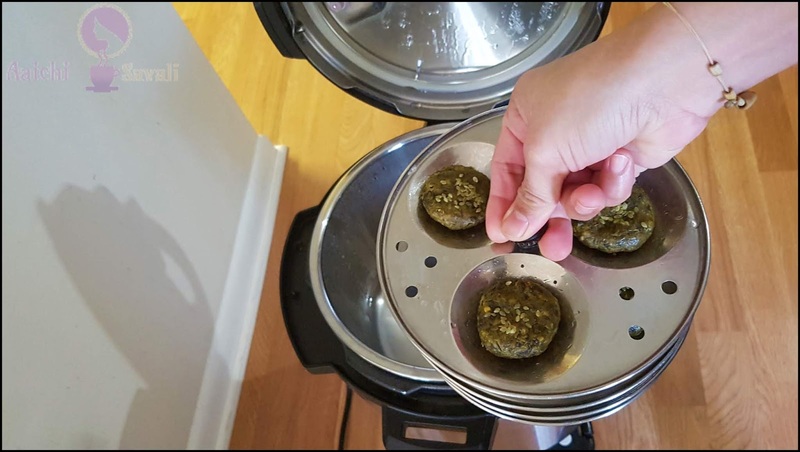 Turn on instant pot and pour 1 cup of water, place Idli stand and close the lid, place vent on sealing position. 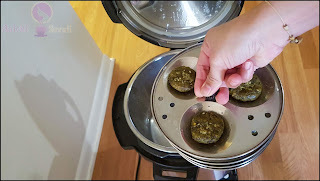 Steam for 10 minutes using steam mode of the instant pot, after 5 minutes quick release. Meanwhile, turn on the flame, place a kadhai or pan and add veg.oil in a pan and fry steamed patties till it cooks well or gets golden brown color. 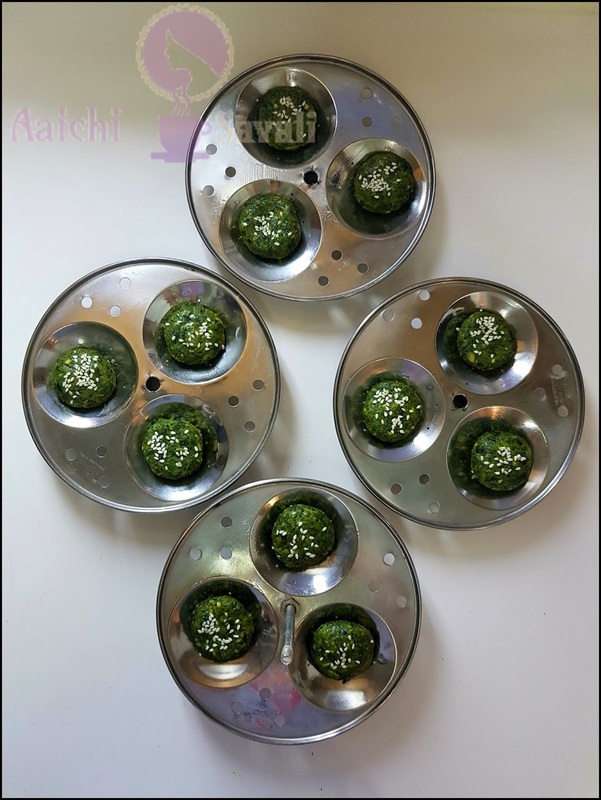 Tadaa, tangy, spicy and nutritious Parsley bites/patties / tikkies are ready to serve, serve hot with ketchup or ranch or garlic sauce, or you can use it as burger patties. Enjoy!!! To make mild spicy parsley bites, avoid adding green chilies. instead of using Idli stand. After steaming whole roll of dough, just cut it into equal portions and fry it. 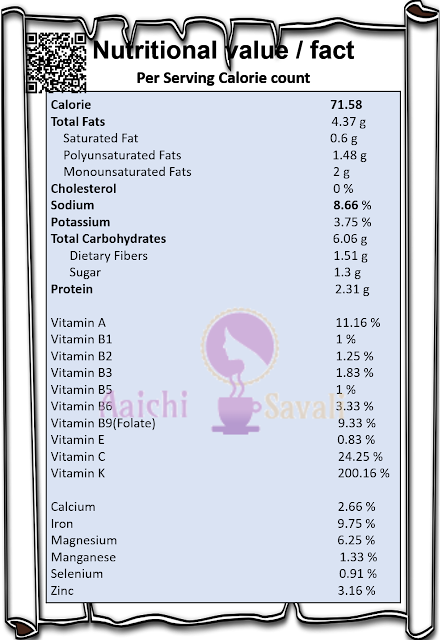 Per serving contains 71.58 calories, along with carbohydrates - 6.06 g, dietary fibers - 1.51 g, fats - 4.37 g, proteins - 2.31 g.
Parsley is known to be a super food because it’s packed with beneficial nutrients, essential oils, and antioxidants. It acts as a natural diuretics and helps to relieve bloating. 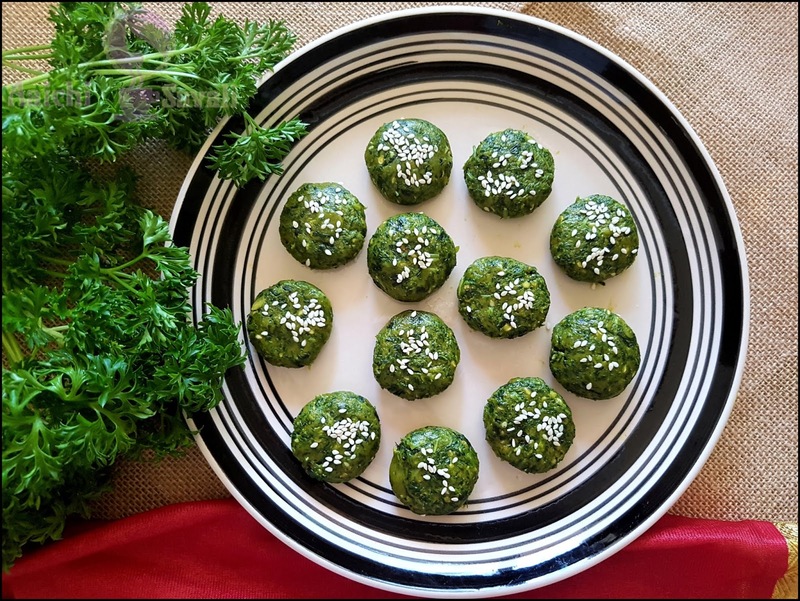 Parsley Patties is an excellent source of bone protecting nutrient, Vitamin K, each serving of Parsley Patti contains approx. 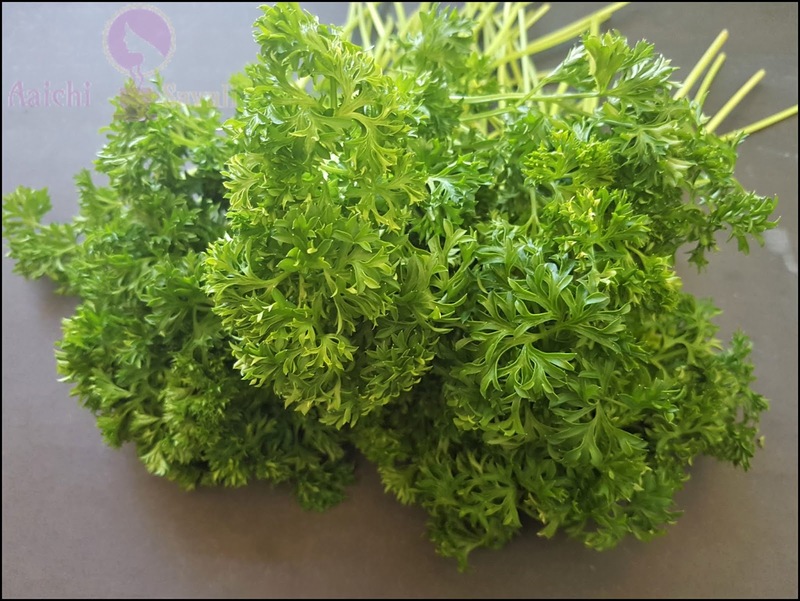 200 % of Vitamin K.
Nutrients in Parsley: 2 tbsp of Parsley provides two percent of your daily calcium, iron and folate, 12 percent of your vitamin A; over 150 percent of your vitamin K, and 16 percent of your vitamin C.
Anemia: parsley is the highest source of iron, which is recommended for patients with anemia. One Parsley Patti has approx.10 % iron. It also helps to Boost Immunity. 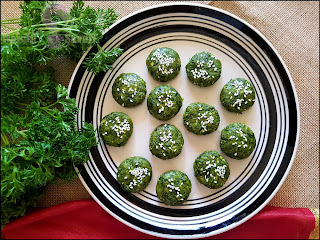 It's good to eat Parsley Patties for breakfast or lunch or evening snacks.